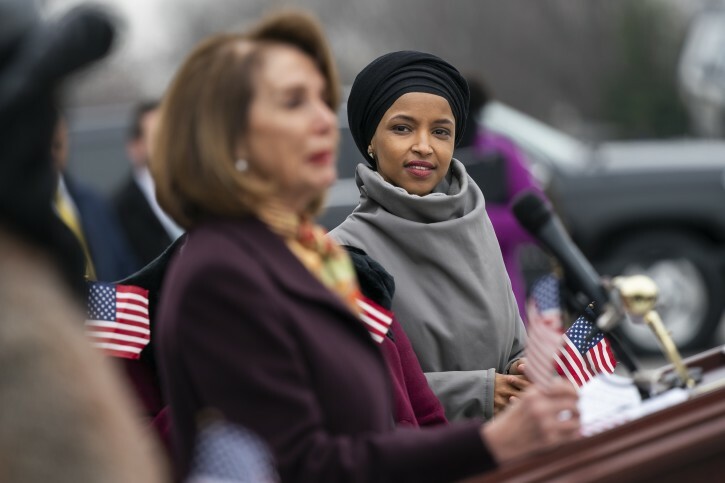 Washington - House Speaker Nancy Pelosi announced Sunday that she has taken steps to ensure the safety of Rep. Ilhan Omar following President Donald Trump’s retweet of a video that purports to show the Minnesota Democrat being dismissive of the Sept. 11 terrorist attacks. “I have had some problems with some of her other remarks, but not—but not with that one,” he said. The Democrats are digging their own grave. They dont ask omar ysv to apologize for her insensitive comment. Instead, they ask President Trump to take down his post. 9/11 is a very sensitive part of American history. And when the speaker takes the side of some idiot freshman that literally steps on the ashes of the victims, people are not going to forgive or forget this. Also, it is a total disrespectful to the victims to politicise 9/11. That is the truest thing you have ever shared; truly inspirational. A perfect metaphor for the current political climate, even if we disagree on the resulting actions. Oh you’re back Mr Crazy himself. You radical anti american leftist piece of garbage! Hey, Nancy, you should be much more worried that omar y’s and the other anti semites in your party, are inciting people against Jews! And to any Jew still stupid enough to vote democrat, if this doesn’t convince you that top dems are going along with the anti semites, you’re shameless! Folks we have our vin baby back in town. Very likely yoni mad that I pointed out his hypocrisy. But it may just be this bored teen off for bein hzaminim. I won't be pointing this out every comment he makes m. To engage this baby lends credence. It's like when my two yr old throws a tantrum. So we will ignore this immature loser. But when you see him writing comments know that I have a particular style in which this baby can't pick up. So watch out for the cues. “ Folks we have our vin baby back in town. Very likely yoni mad that I pointed out his hypocrisy. But it may just be this bored teen off for bein hzaminim. You engage enough to lend credence. Ja ja ja, you think you know which side I'm on, maybe I'm playing for the other side, didja think of that? I responded to you in the other news article and refuted every "point" you brought up. Whoever this troll is (Zalmy or some other yeshiva bachur), it is immature and fallacious of you to constantly bring up ad-hominem arguments against me, particularly considering that your accusations are completely unfounded. P.S. That "comment" is literally a joke, not a comment on the article. Anyone can tell that it is copied and pasted from a jokebook of some kind. It would be nice if the trump voting so called frumme woman in Flatbush/5 Town/Mosey etc would be 1/2 as Tzniusdig that this Ilhan Omar lady. Maybe its time to learn from her. Fake News. The only massacre of Jews in the USA history was committed by MAGA people with MAGA Hats and the Picture of the German jm"s in the truck. That's not me! I go by Cixelsyd_Wnosanoy, except on that article where I addressed Educated Archy directly. How come no one asked Omar to remove the David Duke video? Hey look, it's the real Yonasonw! It certainly seems wise to ensure this member of Congress has additional security. The only massacare of Jews? ANd you tell fake news without such certainty? Aron halberstam was killed by who? They intended to kill everyone in that car. 9/11 Jews like Beigielson etc.. were killed by who? Hey Jew hating kapo scum the biggest massacre of Jews in the US was by your muslim buddies on 9/11. Your beloved democrats continue to support the world's biggest funder of terrorism in Israel your beloved iran. You are kapo scum who will continue to support the dems even as they continue to defend and support Jew haters because you are deranged. Stop with your lies you defender of the holocaust denying democrats. Your beloved messiah the obamanation is also descended from germans. It would be nice if you didn't support Jew haters. Time for Nancy to go-she no longer should represent the Democratic party- Is she converting to Islam anytime soon? Maybe this is her own internal feelings towards Jew that can finally come out in the open. She supports a hateful Muslim-hmmm one wonders.